The 1963/64 field trial season was a watershed period in the history of the sport of bird dog field trials. This was the first season of competition for the Purina-sponsored Top Field Trial Bird Dog or “Dog of the Year” — an award originated to give recognition for the body of work for the entire season rather than that of a single event. The award was gained through credit or “points” earned from placements in open trials listed by the Purina awards committee as the “Major Circuit” trials — those considered most significant offered for competition in that season. The first Dog of the Year award was won by War Storm handled by John S. Gates. 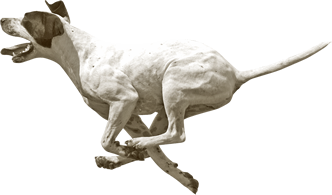 The Purina award not only offered a new and quite prestigious recognition for the All-Age competitors, but also provided a necessary prerequisite for the resurrection of a unique trial — the Invitational Championship. In its inaugural form, a committee of sportsmen of the Southern Amateur Field Trial Club of Albany, Georgia, classified the open trials of one-hour duration or greater in a system of characteristics designed to identify credit available to be earned by placements in those trials. The intent was to identify the top sixteen performers of the previous season for invitation to a championship event designed to provide the most complete and equitable test for the all age competitors. The event was recognized as a “de facto” all-star event for the sport. The champion of the inaugural Quail Championship was won by The Texas Ranger handled by Jack Harper. As has been chronicled elsewhere, the bright promise of the trial was interrupted by World War II and the event was offered in its original form only for two years. During the 1963/64 season, a group of sportsmen accomplished the necessary planning for the resurrection of the event as the Quail Championship Invitational to be contested on the West Kentucky Wildlife Management Area near Paducah, KY in the fall of 1964. The Purina award program provided the “points” system whereby the top twelve performers of the previous season could be objectively identified to receive invitations to the Invitational Championship. 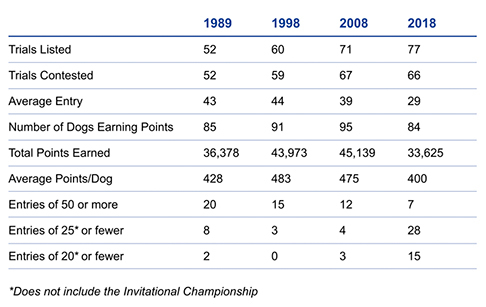 Both the “Top Field Trial Dog” award and the Invitational Championship have been become among the most prestigious titles available to the all age performer for the last 55 years of field trial history. In the inaugural year, the Major Circuit list of trials included only 24 trials, including events in Canada and across the lower 48 states. Since that initial year of competition, the list of Major Circuit trials has grown considerably with trials added and/or moved to different venues and times. This growth of the Major Circuit list and the movement of trials has resulted in a certain amount of stress in the system and it seems appropriate to examine some data that may provide insight into where we have been, where we are now, and, perhaps, be helpful for discussions of where we are going. The data shown here are those that I have accumulated as chairman of the Invitational Championship for a period of about twenty years. There are other, more complete sources of data that might be referenced if the interest is sufficient to warrant. A cursory examination of the data shown reveals several significant trends. First the growth in the number of major circuit trials from 24 in 1964 to 52 in 1989 to 77 in 2018 is certainly significant. At the very least, it is fair to say that we are attempting to support a considerably greater number of open trials than has ever previously been supported in the sport. The expansion of the number of available trials has been accompanied by a significant decline in the average entry in those trials. This is in no way intended to be a statement of quality but simply an examination of quantity or magnitude. There are other measures that could be examined that might bring further understanding such as the proportion of trials designated as championships and/or the number of venues available. The other trends that are quickly obvious are shown in the data concerning entry size by trials. The number of trials with greater than or equal to 50 entries has declined significantly while the number with 25 or fewer and 20 or fewer have increased significantly. Again, there are other data that are available in the record such as that all seven of the trials that had entries 50 or greater in 2018 were in the southeast region of the country. It is not appropriate for me to assume the role of arbiter of the meaning of the data provided. Hopefully these data will stimulate some discussion concerning the state of the sport. If we are the custodians of a great American sport, it seems fitting that we be concerned and willing to discuss how we can help it continue to be strong and vibrant.